Just to say a very big thank you for my lovely new look garden, it is just as I hoped it would be, in fact even better, I am looking forward to getting out there and dabbling with a few plants. Big Thank You best wishes Wendt Russell. Our experience with Barry and his team was simply excellent. From our initial conversations about restructuring our drive, to the great, smart and thoughtful solutions he and his team came up with to solve some of our creative ideas. The project was completed to specifications and the result was even better than we had hoped. Thank you Barry and team!" We now can use parts of our garden we haven't seen for 20 years. The service was first class from the first meeting, design and then the construction. Would recommend to anyone. We had a small and boring garden. With this great but simple design. 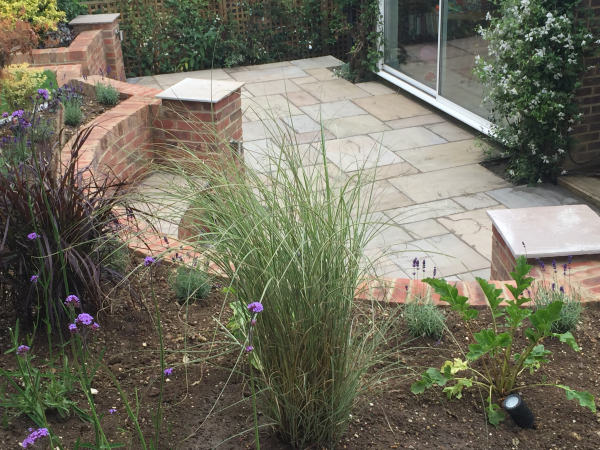 We have features to look at, Planting for colour and a well constructed terrace. Thank you. There are only so many pictures we can put on the website. We have a full portfolio as well as what is on here so let us know if you would like to see other projects. After 19 years we have got 419 references. Only the most recent go on the webite so we try to update regularly. If you feel there are not enough. we can let you have as many as you wish. If you are not sure about the difference that the design and construction can make to your property. Come and see us on a working site. You will see how tidy and professional we are.